An adopted woman searching for her origins discovers she was born in prison. A bank robber reminisces about her first theft in kindergarten. A prisoner serving a life sentence examines the nature of time. A young woman dreams of escape not from prison but from addiction and will sadly fail at both. These are just a few of the stories found in You Don’t Know Me: The Incarcerated Women of York Prison Voice Their Truths. For more than twenty years, New York Times bestselling novelist Wally Lamb has led a writing workshop for the women at the York Correctional Institution, Connecticut’s only prison for women. 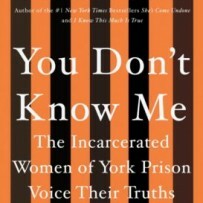 In You Don’t Know Me, their autobiographical essays challenge our assumptions about the incarcerated and the criminal justice system. The fifteen stories presented here offer an honest look at a group of women who write to confront and transcend their histories and their lives in prison, gaining valuable insight along the way. Alongside the women’s writing is Lamb’s own chapter devoted to his reunion with several of his former students—ex-offenders who discuss their lives after prison and their reentry into a world dramatically changed by technology, altered family dynamics, and cultural shifts. In discussion with Lamb, the women movingly recount their reintegration into society, the challenges of finding work, the value of family and support systems, and the ways in which their writing enhanced their rehabilitation. Tackling timely themes and centered on the important issues of mass incarceration and draconian sentencing practices, You Don’t Know Me is a bracing call for rehabilitation and reform using stories that underline the humanity within us all.